Stag celebrations should be all about outdoor action, camaraderie and humiliating the man in question, right? Here at Delta Force Paintball we couldn’t agree more! Thanks to our immense paintball game zones, top of the range equipment and efficient customer service, we are the UK’s most trusted paintball provider. 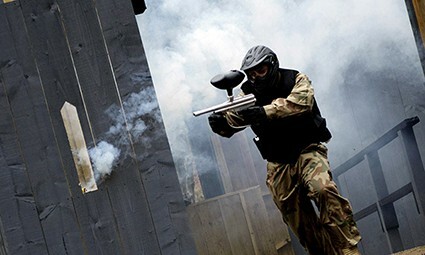 Paintballing brings FPS gameplay to reality, giving players the opportunity to test out tactics, teamwork and sample the awesome firepower of semi-automatic weaponry across a variety of game zones packed full of movie-quality props. If our standard-issue Inferno MKII paintball guns aren’t to your liking – although we are certain they will be – then why not hire one of our awesome replica M16 upgrade paintball guns? Complete with a built-in sight, extended barrel, adjustable stock and removable magazine, a replica M16 gun can really make the difference during your day of paintball for your stag party. Silly costumes and school ground antics may be frowned upon in many public spaces, but we know better than to get in the way of harmless banter! Singling out the groom-to-be brings another element to your paintballing experience and adds an extra incentive for some players to really concentrate their aim. Some game scenarios may require one player to perform a senseless act of bravery against all the odds, or hopelessly defend something to their very last paintball. Let’s just say there won’t be any need to draw straws for that job! Whilst our marshals may look the other way if the stag comes under a little extra heavy fire, all other aspects of paintball safety are regulated as per usual, from our safety briefs to our state-of-the-art equipment checks. Getting a group of lads together for a day out can have it difficulties; some may decide they don’t fancy it, before suddenly changing their minds! With over 25 years’ experience in the industry, we have dealt with almost every scenario and are on hand to assist you every step of the way – we can even customise packages that suit your budget or any special requirements. Whilst it is common practice for stag groups of 40 people or less to mix with other players, for an additional charge, players can hire their own private marshal! This provides you with private matches with a lower group size. A unique ‘Terminator-Pack ’ is available all Delta Force Paintball centres; extra firepower at great value and grenades to give you the ultimate edge over your crafty opponents. For those who like to take risks, you are welcome to film the action as it happens on the battlefield and taking photos around base camp is great for photo ops – even better with any number of military vehicles as a backdrop! The majority of our 28 paintball centres in the UK are so conveniently situated that your closest centre is likely to be only 40-45 minutes away. 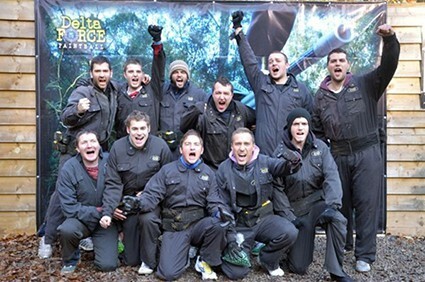 If you’re looking to arrange a stag paintball experience that you and your mates will remember for years to come, contact us on 0203 869 9301and speak to one of our friendly booking team.